Trading multi-timeframe is one of the best ways to achieve diversification in the highly correlated world of Forex trading. Most traders focus on just one market or time frame in their search for the winning trading system which makes the achievement of superior risk adjusted returns difficult. The key correlation metric to pay attention to is ‘underwater correlation’: this is the correlation in trade equity draw-down. To achieve truly superior risk adjusted trading performance it is important to allocate trading capital to diversified systems, markets and time frames with very low historic underwater equity correlations. 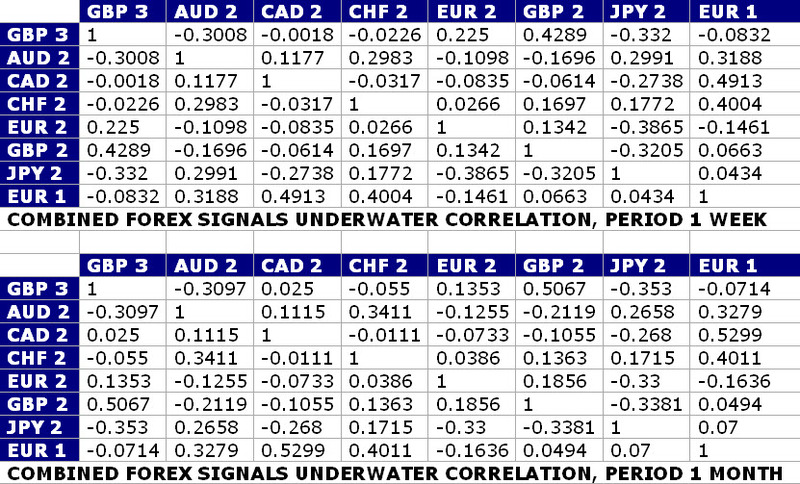 Equally important is to monitor and adapt to underwater correlations in real time trading. Correlations are not static and can change through time. The weekly and monthly underwater equity correlations in our Forex Signals Program are shown below from our most recent performance update August 1st 2012. Please click the tables to enlarge.